A special version or OrbitClock has been released to help you celebrate the end of the Maya B'ak'tun. See below. OrbitClock is a dramatic countdown visualizer that will help you celebrate any special moment in time, such as the beginning of a New Year, a birthday, or an anniversary. Display this fascinating ballet of planetary physics on a big screen to add an unforgettable twist to your special countdown party. During the early stages of the countdown animation, planets fly around a sun in apparently random, uncoordinated orbits. As the special moment approaches, the satellites slowly converge into a fascinating spiral formation. At first, the convergence is imperceptible, but as the countdown continues, the pattern becomes more apparent and eager anticipation begins to build. Finally, at the designated moment (midnight, for example), the planets line up perfectly to signal that the special time has arrived. When the simulation begins, predictive math is used to set the planets in orbital phases that will ensure alignment occurs at the pre-programmed moment. (The laws of physics are honored in these computations.) When alignment occurs, a message "hidden" in the planets is revealed. By default, the hidden message is simply the current time, but you can set it to whatever makes you happy.) There is one planet for each character in the message, and as they circle the sun, each planet leaves behind a trail of fading characters from the message. It is not until the planets line up that the message becomes easy to read. 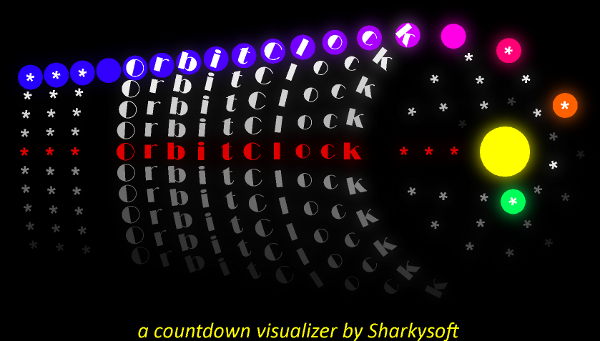 The video below demonstrates OrbitClock as a New Year's Eve countdown visualizer. OrbitClock is configurable and can be customized for a variety of countdown needs. We encourage you to experiment with OrbitClock and find creative ways to use it. The configuration defaults should be adequate for most New Year's Eve parties. The 2012 version is a free gift to you from Sharkysoft. We hope you enjoy it! Please drop us a line and let us know what you did with it. Java 6 or higher (free download) is required to run OrbitClock. Use your mouse's scroll wheel to zoom in and out. Until we add a user interface, all configuration must be carried out through command-line switches. This unfortunately makes custom configuration the exclusive priviledge of geeks. We hope to add a UI soon. Command line usage is described here. This software is a work in progress. Updates will be posted from time to time. Enjoy!